Though still undiscovered by many, Mountain Lakes Preserve is Princeton's "Central Park", located surprisingly close to the geographical center of the soon to be consolidated Princeton. A walk down the driveway at 57 Mountain Ave, leading into Mountain Lakes, reveals it's been a good year for spicebush, whose abundant, lipid-rich berries should provide lots of energy for birds this fall. The berries are just starting to ripen. It all seems natural, but these berries might not be here at all if volunteers hadn't cut down the invasive honeysuckle shrubs that were competing with the spicebush. If you haven't been to Mountain Lakes in awhile, you'll find that it has its lakes back, now that the dredging and stonework is done. The stone wall that makes a sweeping curve along the front of the lower dam is completely new, though built to imitate the old one now buried a couple feet down after they added extra height to the earthen dam. for the phantom craneflies described in a previous post. Across the dam separating the upper and lower lakes can be seen Mountain Lakes House, which has become all the more popular a spot for weddings and other events since the dams were restored and a new permanent roof was built over the patio. If you continue on the driveway past the Mountain Lakes House and head down the hill, you'll find another newly restored dam. The anonymous donor provided additional funding to restore this third dam, built around 1950 (the other dams were built around 1900). In addition to being as beautiful as the others, it serves to catch sediment that might otherwise begin filling in the two main lakes. Dredging this little pond also served to get rid of an infestation of Phragmitis, a highly invasive grass of freeway ditches and wetlands. It cannot be overemphasized just how extraordinary was the generosity of the donor, who provided some $4 million to make these three dam restorations possible. The raingarden on the side of Mountain Lakes House, which catches water from the driveway and roof, has filled in nicely with native plants. Mountain Lakes is one of the finer examples of how human intervention can work with the natural energies of plantlife and water flow to create attractive and productive landscapes. About a year ago, our house underwent a serious invasion. Tiny ants began to show up here and there inside. I had heard of tiny Argentine ants having invaded California, forming super colonies that somehow communicate across vast distances. I guessed that these were those, and felt strangely ready to surrender without a fight. After repeated pressure from family members, however, I finally found the bottle of ant poison that had disappeared into the fabric of the house's disorder since the last invasion of (larger) ants. The new invaders took to the ant poison, though not as avidly as could be desired, and there was this sinking feeling that these highly successful creatures would quickly evolve a biochemical way of turning the poison into fuel to further energize their expansion into new spaces. Soon thereafter, a new thoroughfaire of ants was discovered leading to a stronghold in a spider plant sitting on a metal stand in the dining room. The ants had apparently decided to make our house into a medieval landscape dotted with kingdoms. By this time, my youngest daughter had already abandoned the upstairs bathroom, unable to coexist with such creepy creatures. Unlike ants in the past, which would pick their spots and stick to accustomed routes, these tiny ants would spread out across the kitchen counter and into other rooms. They seemed determined to explore and ultimately occupy every square foot of surface area--walls, family room chairs, the piano. In the study, one crossed the computer screen while another did a high wire act on my glasses. Sweeping the guest room one day, I looked down to find that the dust was not staying swept, but instead scampered off in all directions. At that point, the ants were christened "dust with legs". It was time for action, but I was still preoccupied with the deeper meaning of such tiny creatures having their way in a house of giants. If they were larger, I would have taken action weeks ago, but their smallness, the certainty that squashing any one of them, or even a dozen, would be meaningless compared to their infinite capacity to create more, left me paralyzed. I had become like one of the philosophers in the Monty Python soccer game that pits the Greek philosophers against the Germans, all of whom stroll about the field stroking their beards instead of kicking the ball. The ability of the ants to so thoroughly invade without triggering action correlated with my observation that climate change works similarly, baffling humanity with even smaller malefactors, operating at a scale below our perception, tweaking the atmosphere and ocean day by day until we wake up to a permanently altered world. Finally, my spouse decided to take matters into her own hands. Where, she must have wondered, was the man who had saved her from an infestation of cockroaches, early on in a cramped Michigan apartment? She took emphatic action, dumping borax copiously along edges of counters. I searched labels and the internet for evidence that this lavish spreading of chemicals was putting us at risk, but found little beyond warnings for pregnant women. Interestingly, the ant poison that I had taken great precautions with turned out to be nothing more than dilute borax in a bottle. The borax did suppress the ant presence, though not completely. Fortunately, I happened to talk to a friend who suggested a poison available in a gel form. I found it at the hardware store, with the endearing name: Combat Source Kill Max, which comes with a syringe applicator. We dabbed some in just a few strategic spots, and the ants promptly disappeared, without any further applications necessary. As Archimedes said at the pivotal moment in Monty Python's soccer game, Eureka! Thanks to Melinda Varian, who sent these photos taken by her husband, Lee. 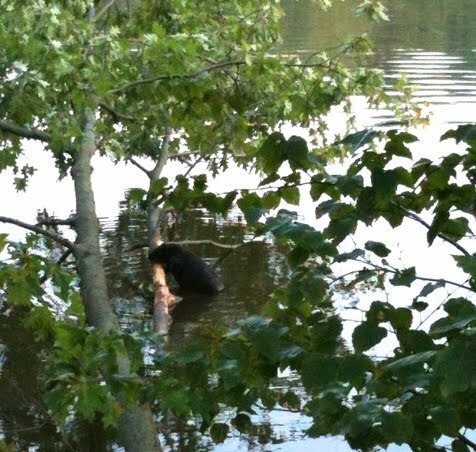 Some beavers go searching for breakfast, while others have breakfast thrust upon them, as when this oak tree fell into Carnegie Lake. "As Lee and I were doing our pre-breakfast walk along the DandR towpath this morning, Lee spotted a beaver gnawing on a tree in the water. It was content to let us watch for quite a while before it finally swam off to its lodge. We could hear the gnawing quite plainly. 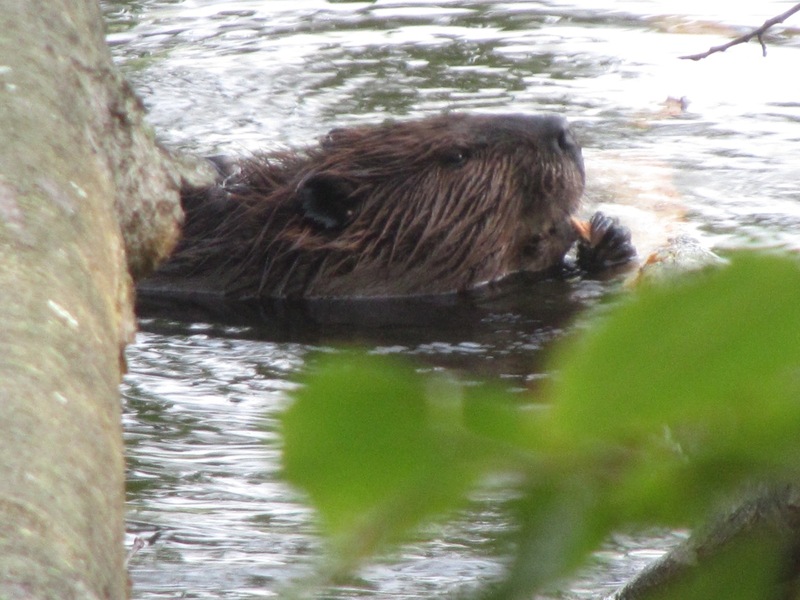 We went back another morning with a better camera and found two beavers gnawing on the fallen tree. As soon as Lee began photographing, one splashed its tail on the water and yelped a warning, which caused the other to depart, but the big one stayed and calmly chowed down on the delicious wood." which periodically became less open as road construction and an overturned truck intruded on the American ideal and our projected time of arrival. and of a sculpture made entirely of grass. It's entitled Wave Field, by Maya Lin, who designed the Vietnam Memorial. We visited the site of my first vegetable gardens, planted back in the 70s on the extension because that was where the sun was, at least until the city's trees grew up. with nearly all the original species still prospering twenty years on, likely receiving no more attention than an annual mowing. Our visit happened to be timed with the rosinweed. Back then, we were living on Easy Street (literally), where neighbors have since talked the city into laying down pervious pavement along the edge rather than customary curb and gutter, and the neighborhood trend towards prairie landscaping continues. A neighbor has led the effort to shift the local park's turf to native wet meadow plantings to capture runoff, feed pollinators, and show what might have been growing there in pre-colonial times. The city does a contained version of a prairie burn on these plantings each spring, a horticultural ritual of cleansing and renewal for which neighborhood parents and kids gather to watch at a respectful distance, then scatter seed in the ashes. The ash after a prairie burn always reminded me of the fur of a bison. and experience, ever so briefly, the profound, forgotten silence that comes when all machines within earshot are turned off. At such times, relieved of the burden of screening out incessant background noise, the mind can open up to the world, relax in a way it may not have in months or years, and take in the crystalline sounds of the forest, deeply rooted in the underlying silence all around. It's common to beat the summer doldrums by heading off on a family jaunt. From the redwood forests to the gulf stream waters, this land is full of breathtaking scenery to fill the soul with beauty and an enduring sense of wonder at nature's splendor. Some are content to simply view it all from a distance, but others of a sturdier, more restless breed seek adventure in the challenge and exhilaration of mountain climbing. and the hardy hikers were rewarded at the summit with a breathtaking view of the great Hamilton River watershed. On the flight home, tired but happy, the family gazed one last time at the mountain range they had just conquered. Back home, however, they had trouble convincing friends of their incredible feats. Some refused to even believe there was such a place as Oak Stump Mountain. This travelogue made possible by bacterial leaf scorch and high winds. to an already florid scene. and woolgrass, which is really a sedge. with a new addition this year, cup plant, which cups water in its leaves. All of this diversity is made possible by controlling the abundance of cattails, which for all their charms might otherwise have reduced a symphony to a monotone. The development of an environmental ethic is much facilitated by the annual consumption of elderberry pie. This year, with the rest of the family out of town, I was able to pass along this family tradition to my older daughter. That tradition, which I became a part of growing up in the midwest, involves seeking out elderberry bushes growing along lakes or sunny streamsides, being lucky enough to find some ripe berries before the birds eat them all, and then rinsing and patiently stripping the berries off the stems. My daughter stripped the berries while watching a movie on the laptop--an interesting integration of tactile tradition with the media-rich present. Having lost, or never learned, the time-honored family recipe, we found one on the internet. Elderberry is a lanky shrub that needs lots of room to grow, usually in low, wet, sunny ground. Unlike most shrubs, it can be easily propagated by cutting a two foot length of stem during the winter, and sticking it halfway into the ground. If placed right side up, the "live stake" will sprout roots and leaves in the appropriate places and, if kept moist the first year, soon produce enough berries to feed the next generation of environmentalists. Note: A friend expressed concern that people might confuse elderberry with the poisonous berries of pokeweed. Anyone eating wild foods should do their research beforehand. I had the benefit of parents and teachers who could serve as guides. If schools put more value on learning plant identification (what a great way to learn to see subtle distinctions in pattern--a skill with many applications beyond botany), kids would feel much more empowered and comfortable out in the woods. I posted photos of pokeweed on September 8. At least this year, it matured a month after elderberry, which will also help distinguish between the two. When I arrived at Pettoranello Gardens to help out with a nature walk for kids in a YMCA camp, AeLin Compton of Friends of Princeton Open Space had already started them on a walk of discovery around the pond. Next on the list of discoveries to be made was the empty shell of a cicada, of which they found many in a tree next to the pond. The kids already had a photograph of the cicada shell on their clipboards (prepared by walk organizer Martha Friend), which helped them in their search for this and other treasures. A post on the adult cicada's magical night-time emergence from the shell, and the dangers they face as slow-flying protein in Princeton, can be found here: http://princetonnaturenotes.blogspot.com/2008/07/cicadas-rise-from-depths.html. While the group headed towards its final stop, I was distracted by leaves that were a ghost of their former selves. The leaves had been meticulously nibbled, leaving the veins intact, looking like fine lacework. The craftsmen, boxelder leafrollers, were working nearby on a fresh leaf. Box elder is not as statuesque as its close relatives in the maple family, but my respect for it has been growing, not for its beauty but for its hospitality to wildlife. This leaf (three leaflets per leaf) has been made ragged by its generous contributions to faunal appetites. The trunk is typically knobby and riddled with holes that provide fine havens for birds and other creatures. Boxelder's "trashy" qualities of low-grade wood, awkward profile and short lifespan can be seen as an auspicious weakness that serves the woodland community well. When I caught up, AeLin was showing the kids how a jewelweed's leaf gains a metallic sheen when put underwater. After a cup of lemonade and a stirring "thank you" to their guides, the campers headed back across 206, framed by counselors fore and aft, carrying their mementos from a walk on the mildly wild side of Princeton's Community Park. Walk organizer Martha Friend, science teacher at Little Brook Elementary during the school year, put considerable initiative into making this one-time walk happen. Given how close various summer camps at Community Park and the Y are to the preserved woodlands of Pettoranello Gardens and beyond, and a naturalist just down the driveway at Mountain Lakes House, maybe there's a way, without too much extra effort, for these guided walks to become a regular part of the camp experience.